Some of you may remember reading Peter Dreissigacker's article here last winter about training for a personal record (PR) in a 2000m indoor rowing time trial. He also described the CRASH-B Sprints, a.k.a. the World Indoor Rowing Championships, held each February in Boston. 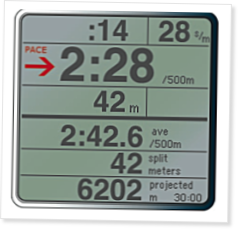 Well, it's almost indoor rowing race season again, and this time we're giving you some lead time so you can fine- tune your 2K PR in time to test yourself at the nearest official satellite regatta. There is a whole series of satellite indoor races held around the U.S. and Canada leading up to the CRASH- B's. These races are open to everyone; no qualifying time required. They all offer the 2K race distance; some also offer longer or shorter events, and some run relays as well. Every year, up to four qualifiers are identified from each satellite race to receive funding from Concept2 for the trip to compete at the CRASH-B's. Qualification is based on meeting a pre-established qualifying time for your gender, weight class, and age group. The full list of qualifying times can be found on Concept2's CRASH-B page.